The French supermarket chain E.Leclerc continues its growth by opening a new centre on the French border with Switzerland in Ville-la-Grand. Entrusted with this project were the studio of interior designer Beatrice Oreal and architect Erwan Sauvetre, who designed enormous arctic glaciers throughout the upper perimeter of the supermarket. The combined work of Beatrice and Erwan has led to an interior design concept in which shapes are combined with light and shadows, creating a backdrop around the establishment, with a total area of 300 linear metres in which the PORCELANOSA Group material, KRION, has been used. 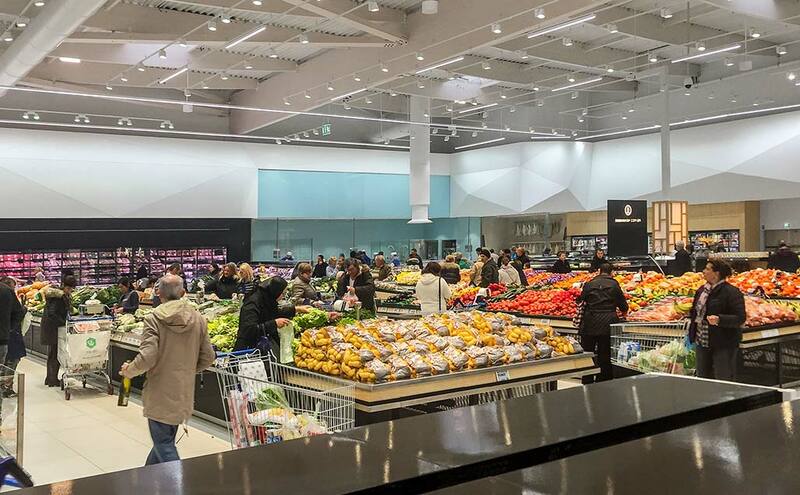 This is not the first time that E.Leclerc supermarkets have used the solid surface KRION, but it is the first time it has been transformed into large pieces with geometric shapes, serving as a wall covering and creating a composition with a high visual impact. The material selected for this work was KRION in its 1100 Snow White version. KRION transformed by the company Savouret.